LOCATION Linden House embodies the true meaning of a central location, with access to the property just off the historic Carfax in the heart of Horsham town centre. This stunning apartment is quite literally a stone’s throw away from the many fashionable bars and restaurants as well as the wide range of shopping in the town. The Carfax retains much of the quirky charm often associated with market towns, yet is only a 5 minute walk away from Horsham mainline station which offers direct links to London and Brighton (via Three Bridges). Also within a short walk of this modern apartment is Horsham Park and Pavilions Leisure centre. PROPERTY You enter the development via double doors, with a video entry system, into an impressive communal Entrance Hall, which has further doors leading to the central atrium, lifts and stairs to all floors. The central atrium with glass ceiling is a stunning centre piece for this newly converted building, creating a central meeting point for the residents. This generous apartment is located on the ground floor with the front door opening to the Hall, which has doors to all rooms and the airing cupboard. Something immediately apparent is the attention to detail and quality of finish from the developer. The stylish Bathroom, with a Utility cupboard, is fitted with an attractive three-piece suite, has a shower above the bath, and a door opening into the double Bedroom, which has plenty of space for built in wardrobes. The bright, double aspect Living/Kitchen Area is a particular feature of this spacious apartment, measuring 17’5 x 17’3 and offering a door which opens to the private terrace. The Kitchen area boasts a range of integrated appliances and provides a generous granite worktop area. The property also benefits from underfloor heating throughout. OUTSIDE The development comes with secure, gated underground parking, with this property coming with two allocated parking spaces and a communal secure bicycle store. 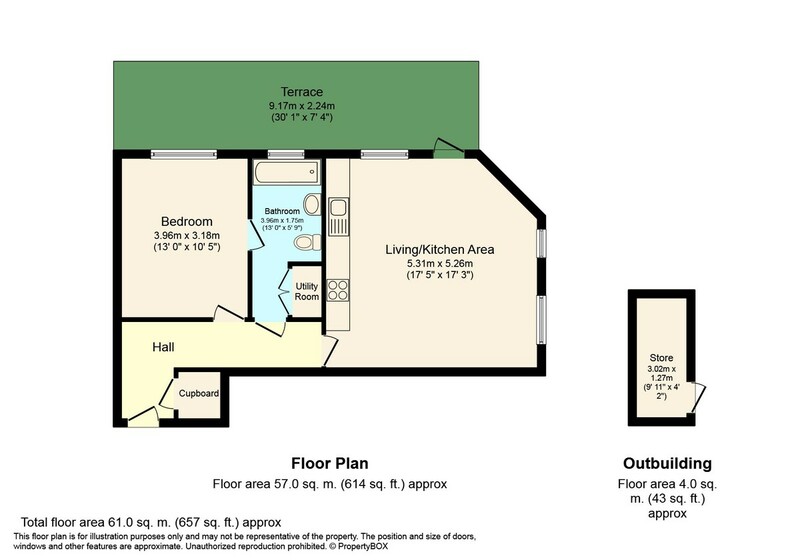 This ground floor apartment also boasts its own 9’11 x 4’2 Store and a 28’11 x 7’4 private Terrace which is accessed from the Living/Kitchen Area. This fantastic space has power and lighting and offers the owner their own outside space which is hidden away behind raised borders planted with an attractive hedge.